Bixby School serves preschool through elementary level children and their families in a small community setting that compassionately empowers children with critical thinking skills, self-confidence, independence and a love of learning; develops their individual gifts; and prepares them to make meaningful contributions to the world. To be a recognized leader in progressive, whole-child, customized education. Children learn best in a safe environment: physically, emotionally, and intellectually. Respect is the cornerstone of such an environment: respect among students, between students and teachers, and among all members of our community including parents and staff. Children are unique individuals, each with their own abilities, interests, and needs. With encouragement and support, children develop responsibility for their choices and actions. Curiosity is natural and joy of learning is intrinsic in all children. Critical thinking skills and mastery of underlying concepts are the primary objectives of school. Children learn best in small groups with extensive opportunities for individual attention and interaction with others. Academic achievement is realized in a non-graded, noncompetitive setting where children are intrinsically motivated to learn. Committed, well-qualified teachers are fundamental to the success of our school. Support for families and continuity for children that builds upon the rich learning environment and social setting of the school day are critical elements of an effective extended day program. Deeply knowing and loving every student as a complete and whole human being. Giving every student what s/he needs through a customized educational experience. Teaching rigorous academic skills through meaningful activities and inquiry-based learning, which fosters critical thinking, compassion, curiosity, creativity, and collaboration. Academic growth is realized through a non-graded, non-competitive setting where children are intrinsically motivated to learn. Nurturing student agency and social responsibility. Learning by doing; we encourage children to take risks and use mistakes as opportunities for growth. Cultivating joy, vulnerability, movement, self-discovery, and adventure in each of our students and in the wider community. Providing challenges that promote each child’s intellectual, social/emotional, athletic, and artistic growth and the maximization of his/her potential. Bixby’s curriculum is informed by research and guided by Colorado State Standards, though our teachers have flexibility in how they reach those benchmarks. Fostering independence through an intentional balance of freedom and responsibility. Empowering committed, passionate, world-class educators to respond nimbly to what is best for their students. Offering a unique elementary schedule with small instructional groups and teachers who are experts in their subject areas. Caring about and connecting with parents to promote engagement and to protect family time: community events, morning greetings, open doors and open hearts, chef-prepared lunches, minimal homework in upper grades, swimming, artist-in-residence, music, sports, foreign language, whole-year/full-day unparalleled care for children. Serving a diverse population of children who are gifted, twice exceptional, typically developing, and those with mild to moderate learning challenges; we are not able to serve students who have significant behavioral or social/emotional challenges. Fostering a small and compelling community that is intentionally safe, inclusive, and authentic. Harlan Bartram (Bart) was a Professor of Mathematics at the University of Illinois in the late 1950s when Congressional funding for math and science education programs (spurred by the space program) drew his participation. It was through his involvement with the School of Education that he first met educators who were as interested in encouraging a student’s analytical thought process as they were in subject matter. Here, the travel was as important as the destination. 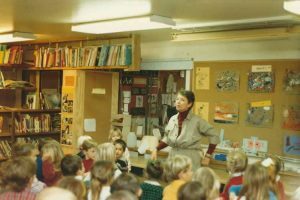 This fresh concept so motivated Bart that he began demonstration teaching, a sort of touring math class for children, intended to spark interest in budding mathematicians and scientists. Young students immediately took to his interesting way of presenting concepts, and Bart, in turn, found new satisfaction in teaching. 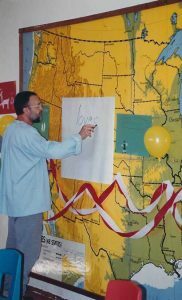 He developed a specialty in mathematics education and a few years later was hired by Jefferson County Public Schools to conduct his demonstrations at area schools. It was on one such demonstration that he first met Pat Baker. Pat Baker, an energetic young teacher out of North Texas State University, had been recruited by Jefferson County Public Schools in the early 60s and was using her creative talents to tackle the challenges of her combination 2nd and 3rd grade class. To accommodate the wide range of abilities within her classroom, she had developed a child-focused educational style that took advantage of everyday opportunities for learning. She had broken down the neat rows of desks, pushed them up against the wall, and created a large open area for group activities, measurement projects, and problem-solving exercises that used real-life situations to demonstrate concepts. She had also created subject and project groups that allowed weaker 3rd graders and stronger 2nd graders to work together without the obvious ability grouping that can strain a child’s confidence. The two teachers began working together on educational projects. Bart focused on a stimulating curriculum, and Pat made certain that individual student needs were met. Their combined talents and passion for what they were doing made them a good team, and soon Bart and Pat began discussions of starting their own school. Their goals were clear: to build a curriculum that supported and encouraged children’s lively intellects and to create an environment that was flexible enough to respond to the individual child. In addition, both wanted to provide stimulating before/after-school care that offered opportunities for growth and learning — an unusual concept at the time. In September of 1970, Pat and Bart opened the doors of their school at the corner of Bixby Lane and 30th Street. All 11 students were preschoolers, most taking advantage of the before/after care provided at the facility. By June of 1971, enrollment grew to 35. From that point on, it was the parents of these preschoolers who propelled the growth of Bixby. Not wanting their children to leave the environment, they began asking for extended-care kindergarten, then 1st grade. In 1974, 2nd and 3rd grade were added. Today the school offers programs for preschool through 5th grade. Bart remained active in the school’s mathematics programs after his retirement and up until his death in 2012. He was called, “our George Balanchine,” the choreographer that taught a new generation of teachers how to think about math, the teaching of math, and the possibilities of a well-timed question on a child’s development. With Bixby’s mission and core beliefs in place to guide us, those of us at Bixby today look forward to a future built on the enduring legacy of our founders, Pat and Bart. We are currently embarking on our next phase of the strategic planning process to continue to move Bixby School into the future. Our administrative team is strong and experienced and our Board of Trustees is rich in talent and educational expertise to plan for and embrace Bixby’s future. Progressive education continues to be timely and essential and our community at Bixby School will continue to lead the way with best practices, innovative pedagogy, and reflective thinking around 21st century education, learning, and students.